Preheat oven according to package instructions. Line cupcake tin with paper baking cups and set aside. In a large bowl, beat together cupcake mix, water, canned pumpkin, eggs and pumpkin pie spice on low speed for 30 seconds, then on medium speed 2 minutes, scraping bowl occasionally. Fill each baking cup 1/3 of the way, making sure batter completely covers the bottom. Set remaining batter aside. Squeeze filling pouch 20 times, then cut off corner of pouch at cut line and divide filling equally among the cupcakes by squeezing a small amount in the center, making sure filling does not touch sides. Use all the filling. Place a small dollop of maple syrup on top of the filling, if desired. Scoop the remaining batter evenly over the filled cupcakes, making sure the filling is completely covered. Top with pecan pieces and lightly press down into batter, if desired. Bake according to package instructions (about 24 to 29 minutes). Remove from oven and allow to cool at least 20 minutes before eating or removing from pan. In case you’ve been hiding under a rock, it is officially fall. For me, that means a whole new abundance of flavors is just waiting to be used for baking. From cloves to pumpkin to nutmeg, I can’t wait to celebrate the flavors of the season with yummy treats from my oven. But what’s a boy or girl to do when he or she wants all of those fall flavors in one delicious dessert? 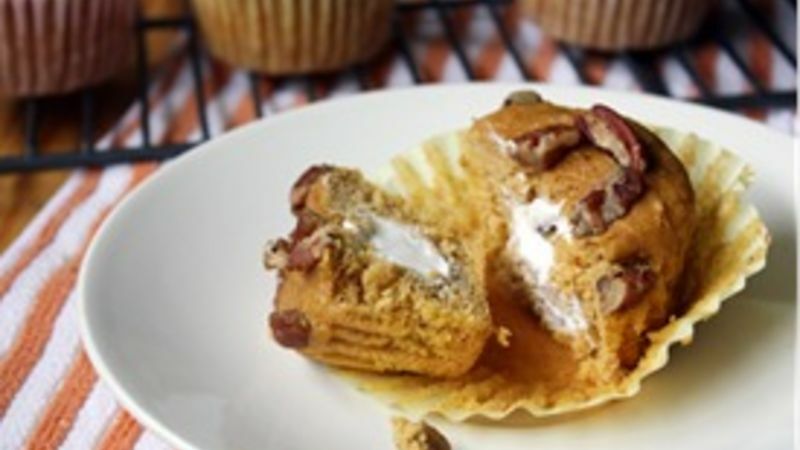 Answer: Bake these Pumpkin Pie Cupcakes. When I first got my hands on a box of these cute and creative Fun Da-Middles, I knew they would be just the thing for making an easier and quicker version of pumpkin pie. The mild yellow cake flavor of the cupcakes lends itself well to pumpkin pie flavors like nutmeg, ginger, cloves and of course, pumpkin. But the best part is the vanilla frosting stuffed on the inside. What a nice surprise when someone bites into these cupcakes and discovers the yummy filling in the center! At least, that’s how I feel about them every time I eat one – and I already know what to expect. You can top the filling in your cupcakes with a dollop of maple syrup, if you want, or leave it out. You can also top your cupcakes with pecan pieces, or leave them plain – they’re delicious either way. The pumpkin replaces the oil in the recipe on the box, so only a few extra ingredients are necessary to make these moist, flavorful cupcakes. When you’re craving pumpkin pie but don’t have the time or the energy to make one, bake these fun little cupcakes. It’s a simple and easy way to celebrate fall (that, and playing in the leaves).